Launching in beta today in California is the YC-funded Leaky. Like a Hipmunk for car insurance, Leaky’s premise is simple enough; visit the site and you’ll be prompted to fill out an online questionnaire covering all sorts of vehicle-related questions like make, model and mileage of your car as well as demographic information like education level and employer. When you complete the quiz, Leaky immediately serves up a selection of car insurance quotes from five of the top insurance carriers as well as others, including Geico, Esurance and Allstate. While individual car insurance providers already have the “fill out questionnaire” -> “get quote” functionality on their individual sites, no one in the US is aggregating realtime quotes from multiple providers like Leaky is. And unlike UK counterparts Moneysupermarket.com and Confused.com, where regulations are relatively uniform, Leaky has the added challenge of insurance restrictions being different for each individual insurance companies across all 50 states. Basically this means that Leaky has to crawl the APIs for five or more insurance carriers, for the fields corresponding to the answers to 40 questions, across 50 states. “When we first started writing code in January we thought it would take a couple of months, then we realized it was a beast,” co-founder Jason Traff says. Indeed, many in the insurance sector purport themselves to do exactly what Leaky actually does (which is hard) but instead incorporate some cop-out lead gen or spammy element. 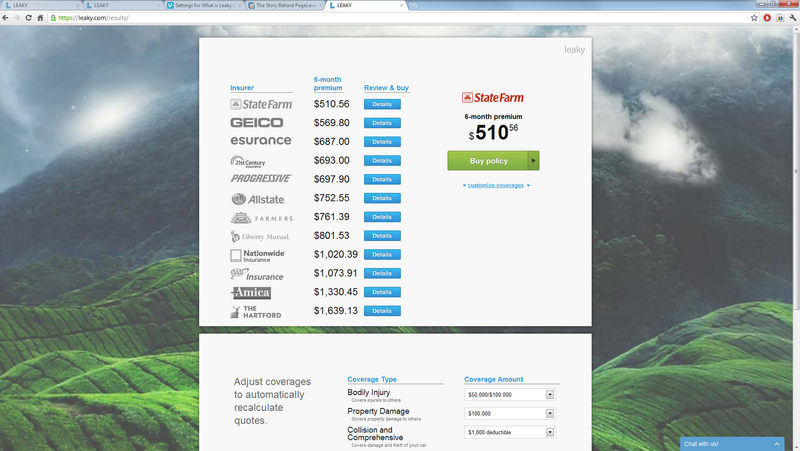 Traff explains that Progressive just estimates what your car insurance quote would be based on publicly available data. He tells me that services like Carinsurance.com and Insurance.com only show quotes from their partner agencies, which tend not to be in the top ten. He also says that leadgen services like Netquote have you fill out a questionnaire but do not result in online quotes, rather in a series of sales phone calls over the next couple of days. Sounds horrific. Free for users, Leaky plans on monetizing by charging affiliate fees for every customer it brings to insurance companies. Nix and Traff tell me that they estimate they’ve saved the 700 people who’ve signed up an average of $313 a year. They estimate the size of the auto-insurance premium market to be $200 billion annually, $20 billion of which results from carrier switching. So if it’s actually saving people money and has the potential for profit, why the name Leaky? Nix says, “Well most people find insurance really boring and we wanted a domain name to make people think ‘What the hell? How’s that related to insurance?’ And as it turns out, it’s working because we are having outstanding recall of our domain name!” The founders expect to have expand to all insurance companies across all states in the next 60 days.